Good Minus. No Jacket. 8vo. Spine darkened and heavily chipped/rubbed with some splitting. Boards rubbed and bumped. Hinges cracked but text block remains fairly firm. Owner inscriptions and stamp to front endpapers. Occasional spot, else pp clean and bright. Book A facsimile of this important work on the hand. First thus, the first edition of this facsimile printed in 1979. This facsimile has been issued by the Pilgrim's Press. 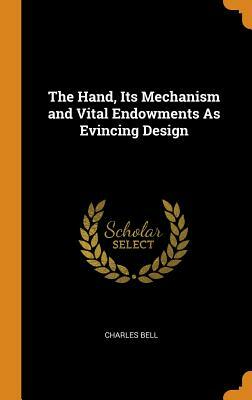 The Hand and Its Mechanism is a collection of treatises on the hand. Bell compares 'hands' of various organisms and reflects on the significance of the hand and its important use in anatomy. It looks at the physiology, kinesthetics and adaptive importances of the hand, among many other points. Illustrated throughout, with numerous vignette illustrations. Condition: In a full leatherette binding. Externally, very smart with minor bumping to the head and tail of spine. Prior owner's notations to the front pastedown in pencil. Internally, firmly bound. Pages are brightand clean. Overall: FINE. New. Trade paperback (US). Glued binding. 236 p. Contains: Illustrations, black & white. New. Sewn binding. Cloth over boards. 236 p. Contains: Illustrations, black & white. New. Sewn binding. Cloth over boards. Illustrations, black and white.